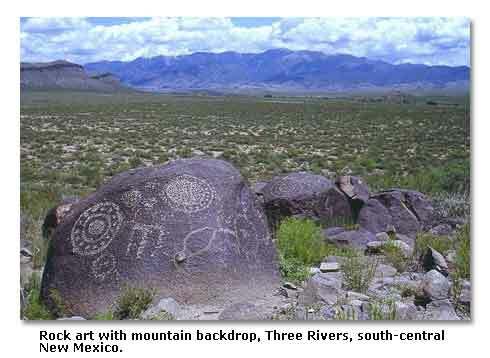 In the desert basins and mountain ranges of the Southwest and northern Mexico, you will discover, on the surfaces of boulders and rock exposures, galaxies of enigmatic figures chiseled or scribed or painted by human hands hundreds to thousands of years ago. 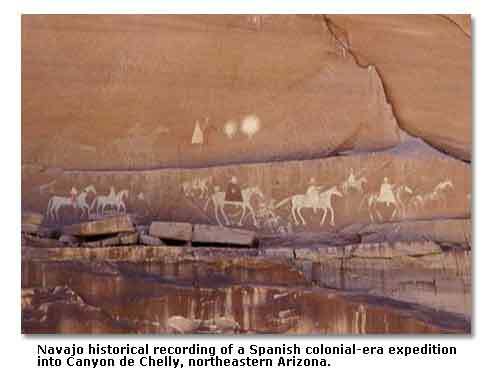 These images on stone, says preeminent authority Polly Schaafsma in Indian Rock Art of the Southwest, are “probably man’s most enduring art form.” They also rank high among man’s most beguiling and mysterious expressions of worldviews, belief systems and spirituality. On stony surfaces across our arid land, you may find, for instance, strangely abstracted and haunting graphic expressions of a mind apparently untethered from reality, presumably the work of a hallucinating shaman reaching for the spirit world. You may find figures, awash in symbolism, of prehistoric deities, rituals, masks, dance, ceremonies and pilgrimages. You can see portrayals of warriors with shields, each covered with the symbols of the owner’s magic. You may find representational, stylized or even whimsical depictions of men, women and children; mammals, birds, fish, reptiles and insects; and agricultural plants, especially corn. You will often see images of human faces, eyes, handprints, footprints and animal and bird tracks. Always, you will find geometric designs  for instance, spirals, concentric circles, zigzags, parallel lines and step-fret shapes  visual odes to a long-forgotten purpose. 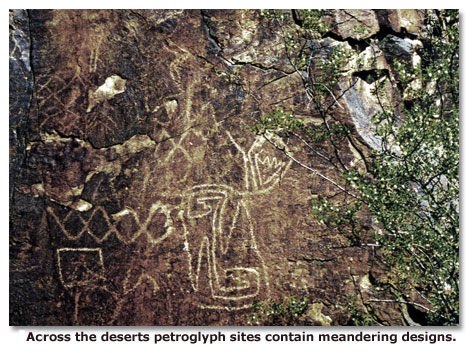 Should you explore the rock art of our deserts, you may become ensnared in one of the great mysteries of Southwestern archaeology: What do the images signify? What do they mean? Puzzling over the images, you may soon recall Winston Churchill’s famous phrase “an enigma wrapped in a mystery” (which he used to describe the impenetrable Soviet Union). Anthropologists, archaeologists, art historians and other scholars have a difficult time addressing the question. Oftentimes, they cannot look beyond an image to see the abstract notions and beliefs that inspired an artist to produce it. They have few tools for dating most rock art. Sometimes, they cannot correlate rock art with other archaeological records such as structures, fire hearths, potshards, stone tools and bones. Still, they have offered speculations about the meanings, sometimes generating considerable disagreement and controversy. Anthropologist and investigator Kay Sutherland once suggested to me that prehistoric shamans, who most likely used hallucinogenic plants such as the Sacred Datura to induce an “otherworldly” state, may have produced rock art for use as portals through which they could enter the spirit world. Speaking to the importance of shamans in their book Tapamveni, Patricia McCreery and Ekkehart Malotki said, “The role of the shaman is to benefit and regulate the well-being of his people. He (or she) is capable of soul flight to the upper world or travel to nether realms to mediate with spirits and gods. The shaman combats evil, cures illness, promotes fertility, controls weather, and with the help of animal spirit helpers, ensures success of the hunt.” Shamans probably produced a high percentage of our rock art. Moreover, as F. A. Barnes said in his Canyon Country Prehistoric Rock Art, “…it is fairly certain that a lot of Anasazi [the Puebloan tradition of the Four Corners region] and Fremont [the Puebloan tradition of southern Utah] rock art was created for ceremonial purposes, whatever its figures depict. Other high probability meanings and uses are sympathetic magic (as depicted by innumerable hunting scenes), territorial claims (such as clan or dwelling area boundary markers), fertility symbols (coition, pregnancy and birth), special individuals (highly decorated or unusual anthropomorphs), supernatural beings (definitely non-real figures, probably for ceremonial use), weather control (clouds, lightning, whirlwinds and rain), record keeping (counting marks), astronomical events (depictions of supernova and solar calendars), cultural intrusions (macaws) and a variety of other minor uses.” Other authorities suggest that rock art figures may depict historic events, migrations, cultural relationships, trade expeditions, maps, traders and trade routes. In his controversial The Rocks Begin to Speak, La Van Martineau contends that artists produced images as a form of “rock writing.” In one example, he suggests that figures on a vertical rock wall at western Texas’ Hueco Tanks State Historic Site symbolize the story of an 1839 battle between Mexican militia from El Paso and Kiowa raiders from the Southern Plains. He points, for once instance, to an upside-down figure that represents, in his view, a dead Kiowa. In their rock art, the prehistoric and early historic peoples of the Southwest left us with a compelling, if often bewildering, view into their religious and material lives. You may find that some of the most fascinating images include those that recur frequently, sometimes in different forms, over a wide range through long time periods. These may hint at cultural contacts, development, affiliations and ranges. Among the most prominent are figures such as Kokopelli (possibly a god of well-being and fertility), Quetzalcoatal (a deity of agriculture, water and fire), Tlaloc (a deity of storms and rain), a Blacktail Rabbit (a symbol of the moon and fertility) and the Storyteller (presumably a keeper of tribal history and mythology). Kokopelli, often called the “humpbacked flute player,” appears in many forms, possibly spanning a wider area than any other single representational rock-art figure. At least one authority, Michael Claypool, who has taught short courses on Kokopelli (a Hopi word) at Fort Lewis College in Durango, Colorado, suggested the possibility that the figure had origins in Peru more than 1000 years ago. A widely experienced archaeologist friend has told me that Kokopelli-like figures turn up, not only across the Southwest and northern Mexico, but also in southern Mexico and Central America. Typically distinguished by an arched back and a clarinet-like flute, Kokopelli appears in Southwestern rock art in many forms, for instance, as a kilt- and sash-clad human, a humpbacked rabbit, a mountain sheep or a locust. A charismatic figure, he appears to take the role of an impregnator of women, a leader of a migration, the choreographer of ceremonial dance, or the guarantor of hunting and farming success. He may be portrayed as dancing, sitting, lying or walking. Historically rooted or mythical, Kokopelli apparently had a pivotal role in ancient rituals and the history of the prehistoric Southwest. Quetzalcoatal, with origins in the great city-states of southern Mexico, or Mesoamerica, first appeared as a plumed serpenta snake with a plume of feathers above its head. He gave humankind corn, domesticated animals, irrigation technology and fire. In some Puebloan societies, he commands underground water sources, and, if displeased, he can cause earthquakes and floods, according to Schaafsma. Borne northward into the greater Southwest, possibly by traders and religious proselytizers, Quetzalcoatal apparently evolved from a serpent with a feathered plume into a serpent with a feathered plume and a forward-pointing horn then into a serpent with only a forward-pointing horn and finally into a serpent with a backward-pointing horn. His progression may have been attributable to the influence of pre-Puebloan hunting cultures, which often used animal horns in their symbolism, suggested Sutherland in her “Spirits from the South,” The Artifact, El Paso Archaeological Society. He seems, according to a variety of sources, to be associated with a portfolio of other symbols, for instance, a bearded and helmeted man, a collared jaguar, the spiral, and an outlined cross or star symbol. Tlaloc, usually signified by goggle eyes, a snarling mouth and bared teeth, also originated in Mesoamerica. Conveyed northward into the Southwest, presumably by Mesoamerican traders and proselytizers, he seems to have ascended in importance in parallel with emergent Puebloan traditions. Closely associated with agriculture and rain, Tlaloc, like Quetzalcoatal, seems to have evolved in his Southwestern manifestations, possibly because of the influence of hunting cultures. From elaborate and stylized faces in Mesoamerica, Tlaloc morphed, for one example, into a figure with a trapezoidal head and trapezoidal body, said Sutherland. “The head has goggle eyes and an ornate head dress; the body is decorated with Mesoamerican design motifs.” Although the connection is uncertain, Tlaloc-like goggle eyes and snarls appear in numerous other types of figures across the Southwest. Often, perhaps in a kind of shorthand recognition of Tlaloc’s omnipresence, only goggle eyes or a snarl appear in rock art galleries. The rabbit, as an icon of the moon, conceivably had transoceanic origins that pre-date Mesoamerica. In “The Mesoamerican Rabbit in the Moon: An Influence from Han China?” Archaeoastronomy, Charles R. Wicke said, “Representations of a hare or rabbit on the moon are found in the art of ancient China and in Pre-Columbian Mexico. Mythologies of both areas also place a rabbit on the moon. Although such linkage might appear to be arbitrary, a comparison of the visible surface of the full moon with the silhouette of a rabbit does reveal a degree of congruence. Not only the distinctive ears of the rabbit but also other features appear to be delineated on the moon’s surface.” As you might expect, Wicke’s assertion generated considerable controversy. The rabbit, rather than a man’s face, has been seen through time on the surface of the moon by many cultures worldwide. Once it arrived in the Southwest, it took on the features of the native Blacktail Jackrabbit, appearing both on rock art and ceramics. Storyteller  a name suggested to me by a tenuous source  ranks as one of the more animated human figures in the rock art of the Southwest. Wearing a fanciful headdress and waving arms, Storyteller sits with the left leg folded up beneath him (or her), turning to address presumably rapt listeners. 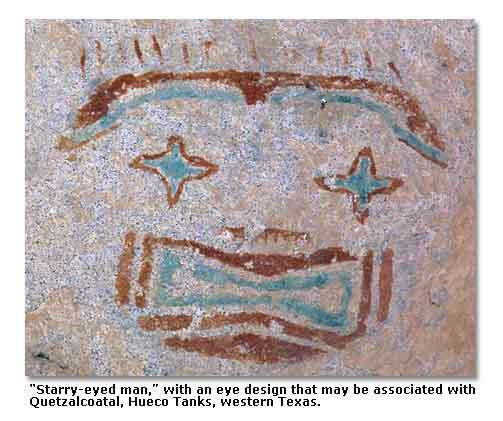 From uncertain origins, Storyteller makes occasional theatrical appearances in rock art panels from western Texas across southern New Mexico and probably beyond.